Lunch: Monday - Saturday: 11:00am - 5:00pm. Dinner: Sunday - Thursday: 5:00pm - 9:00pm, Friday - Saturday: 5:00pm - 10:00pm. Sunday Brunch: 10:30am - 2:00pm. Ample parking available on site for individuals and tour buses. Free live music each Tue and Thurs night from 6:30 to 8 pm. 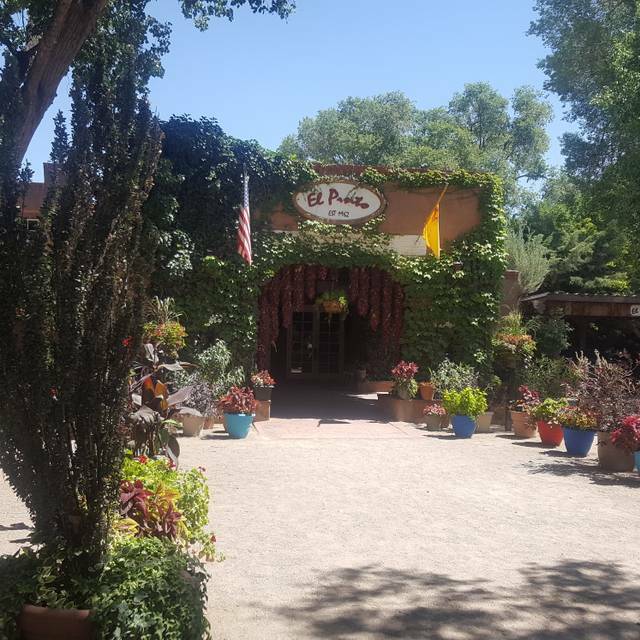 Nestled in the cottonwoods, El Pinto was founded with eight tables in 1962. 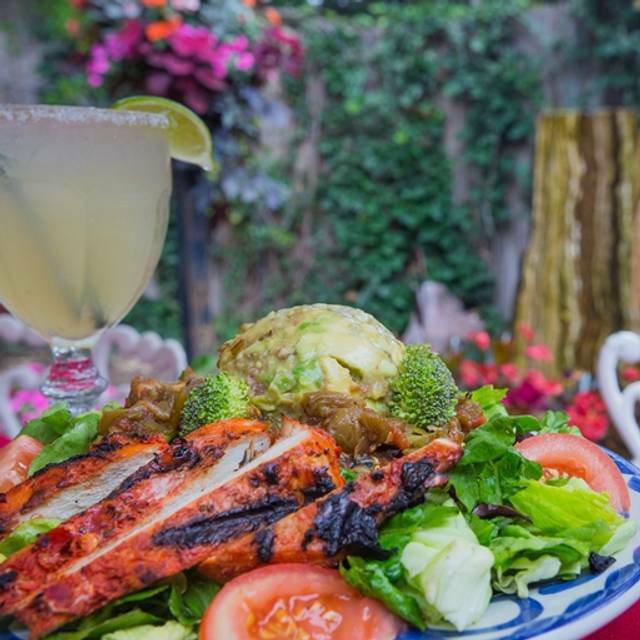 Twin brothers John and Jim Thomas, known as the Salsa Twins, carry on the family tradition and have expanded El Pinto into the quintessential "Spot" for healthy and fresh New Mexican cuisine. 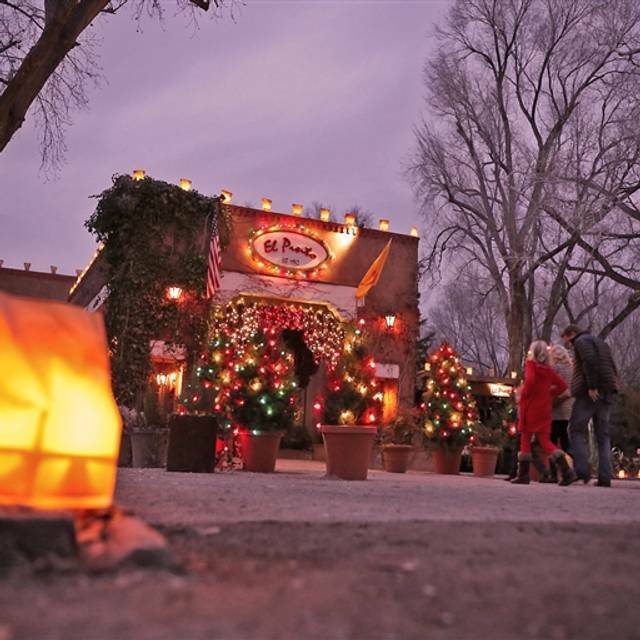 Experience an authentic Taste of New Mexico. The Salsa Twins are pairing tradition with innovative healthy nutrition at El Pinto. El Pinto is proud to have the first and only Animal Welfare Approved laying hen program on property. 200 hens lay pasture raised eggs for daily use. An onsite green house produces over 5,000 lbs of organically grown greens. Freshness is throughout El Pinto. 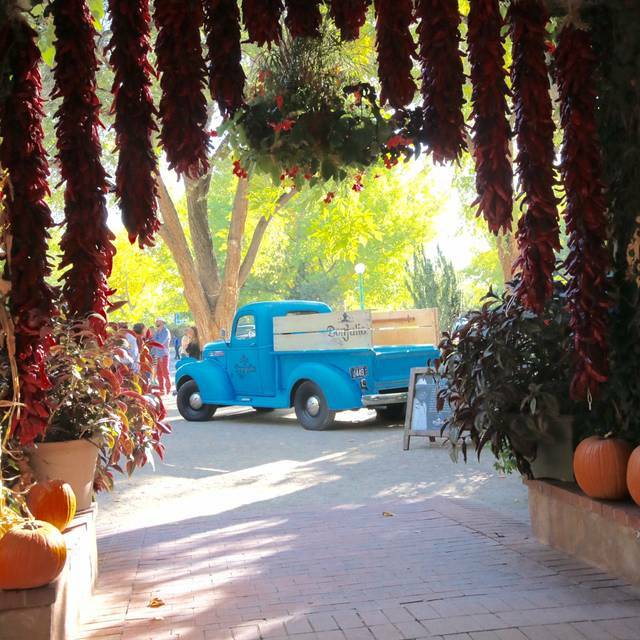 El Pinto uses chile from Hatch, NM, dryland beans from CO, healthy sunflower oil for frying, Celtic sea salt for seasoning, and local ingredients when in season. It has been featured on Food Network, Travel Channel and the BBC among other places. Dog friendly. Ask for the "Puppy Patio." Served Mon-Fri 11:00 a.m. - 4:00 p.m.
Chicken, pork or beef with pinto beans in a flour tortilla with rice on the side, smothered with cheddar cheese and your choice of red or green chile. Pinto beans, rice, and cheese with your choice of red or green chile. Two sopapillas stuffed with red or green chile, pinto beans, and your choice of chicken, beef or pork, garnished with lettuce, tomato and cheese. Lean pork served in red chile with pinto beans and a tortilla. Your choice of beef, pork, or chicken rolled enchiladas with pinto beans and rice. Two tostada cups filled with chile con carne and pinto beans topped with lettuce, tomatoes, cheese, sour cream and guacamole. Three flat or rolled corn tortillas filled with chicken, cheddar cheese, and your choice of red or green chile. Flour tortilla shell filled with choice of meat (chicken, beef or pork) topped with pinto beans, rice, lettuce, tomato, guacamole, cheese, sour cream and your choice of chile. 8 oz. ground chuck patty, charbroiled, and served on a white or wheat bun with a side of El Pinto fresh guacamole and fries. Garnished with lettuce, tomato, red onion and a pickle slice. An 8 oz. grilled chicken breast served on a white or wheat bun with a side of El Pinto fresh guacamole and fries. Garnished with lettuce, tomato, red onion and pickle slice. Grilled flour tortillas with cheddar and monterey jack cheese topped with guacamole, garnished with lettuce and tomato, and sour cream. Served Monday through Friday from 11:00 a.m. - 2:00 p.m.
We had a waiter named Nic and he made the whole experience a great one. When service is great the food almost doesn't matter, but the food was good as well. Every time I visit El Pinto, the prices have steadily rose. It seems like everything on the menu rises about $1 each year. I mean the food is ok, but it is definitely not worth the $17 for a cheese enchilada plate that they offer! We usually go for the chile ribs and they are fantastic each time, but even those have risen to a price point that will eventually stop us from going there. Even the margaritas are ridiculously expensive...$12 for a glass! I mean come on! They aren 't that fantastic. I can go to Tomasita's and get a fabulous Margarita for around $7.50 and it packs a huge punch! Anyway, be careful El Pinto, your prices will eventually price you out of the market and from the looks of things, you were not too busy when we went there, and it was a Friday night! Meet friends that I have not seen in 10+ years. Great service and good food! We had a large group of family and friends who had not seen each other in quiet a while. The setting was very nice for the occasion. What a place - its huge (seats 1500 people in 9 different rooms)! And truly just feels like a festive experience kind of place. The food was good, if not excellent, but the service and ambiance and good value for money made up for any lacking in refinement. Classic NM treats. The waiter's indulgence was superb. We sat and talked for almost three hours. He came around constantly to ask if we needed more water, drinks, etc. Hope that the tip was good enough. Give him a raise-we'll return based on his kindness. 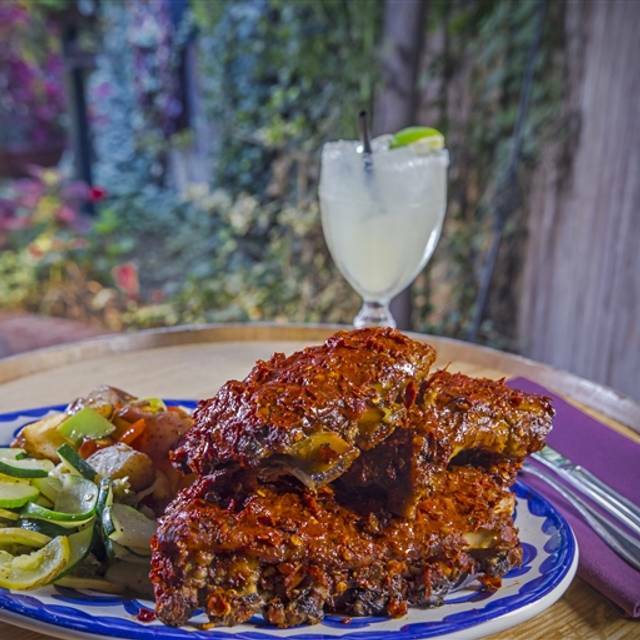 Classic New Mexican menu in a classic New Mexican setting in the North Valley. Convenient location (accessible, easy to find), large parking lot, large facility with a wide variety of indoor and outdoor environments. Ask to see the model of the USS NEW MEXICO, SSN779. Cordial service. We dine here for special occassions, when we have guests in town, and for meetings of various sizes. Do yourself and your friends a favor - go there. Best chips and salsa I ‘ve ever had!! Food was pleasantly spiced, fresh, and presented nicely. Outstanding waitress, who knew the menu and made excellent recommendations. Tequila menu was superb. A must visit for anyone visiting Albuquerque. Food was fantastic! Our server, Emilio, was polite, patient, and very accommodating. Atmosphere was just what we wanted to celebrate our anniversary. When I say I would mot recommend this restaurant, it would depend on what was being looked for. The service (Nicholas), margaritas, guacamole, and ambience were excellent: go there for a drink and snack. But the main meals were all quite ordinary: we have had much better Mexican, with more taste and freshness in Albuquerque. The price is too high. Service and ambiance great. It’s our go to place for out of town guests. A menu that caters to a variety of appetites, great service, unique ambiance. Pro tip: ask for the Fiesta room. It’s the outdoor patio. Walking inside felt like I was in an authentic Mexican restaurant. The building has aged well, and small features like a wood-burning stove in each "wing" was a nice surprise. However the value of dining is not based solely on atmosphere. Beginning with the appetizer, they offered a small bowl of guacamole for $10. The guacamole wasn't even blended well, nor was it skinned well. It was extremely bland so not only was the quantity small but the taste was no better than store-bought. So I really don't see how they think they can charge $10 for that. Also the chips tasted just like Tostitos. Other restaurants like El Patron have excellent homemade chips and salsa. El Pinto's chips literally looked like they dumped Tostitos on a grill for 60 seconds to warm them, scraped them off, and served them to us. They could have at least tried to salt them I suppose, but I don't know what could have made these seem any less store bought. Then our server, she was interested in everything but serving us. Running back to the kitchen for everything from drinks, to straws, to napkins, not coming around to ask how things were, or even offer refills. And on the rare occasion we could ask her for something, she would send a busboy out to service the requested item. I understand we were a party of two, but when two people feel like they are a bother to the waitress because she's more interested in the party of 10, then it makes me less inclined to want to go back. It was my first experience there, possibly my last although I won't rule anything out. I hear a lot of good things about different items on their menu, but the prices and service likely ruined that for me. 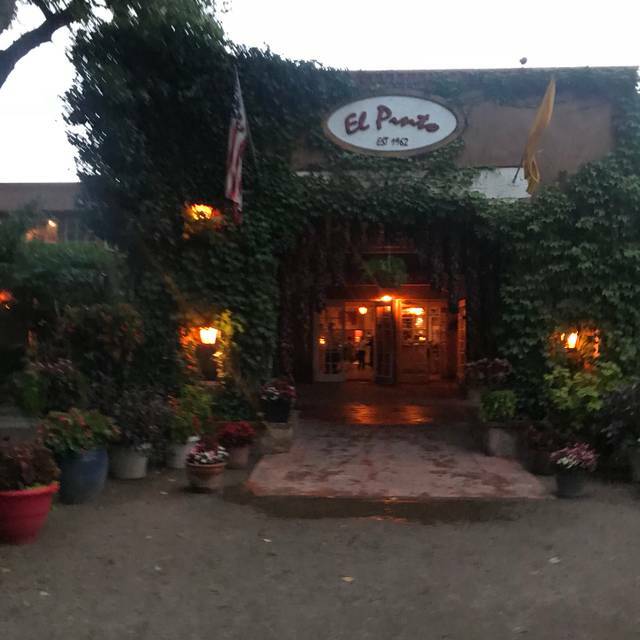 If you are looking for a good atmosphere to have dinner, El Pinto is top-notch. But if you want authentic Mexican food at a reasonable price, I think there are plenty of other places in the city to look. This is my favorite restaurant! I cannot go to another Mexican restaurant without comparing it to El Pinto. The food was average at best. We had a party of 14, and half of the meals were served 20 minutes after the other half were served. Ridiculous! 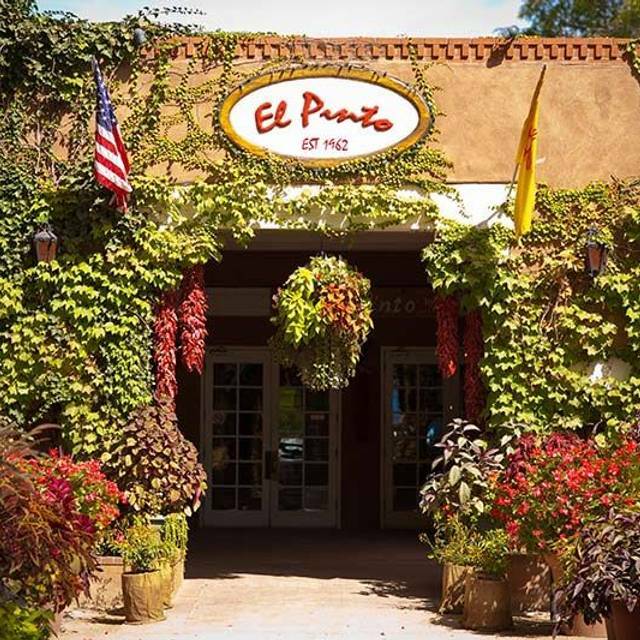 Always a pleasant dining experience and so proud to be able to take out of town family and friends to El Pinto! Our waitress Tamara was amazing and very attentive! Outstanding service! Everything was great, except for their drinks. It was ALL ice, very little margarita. For the price they are charging, you get ripped off! 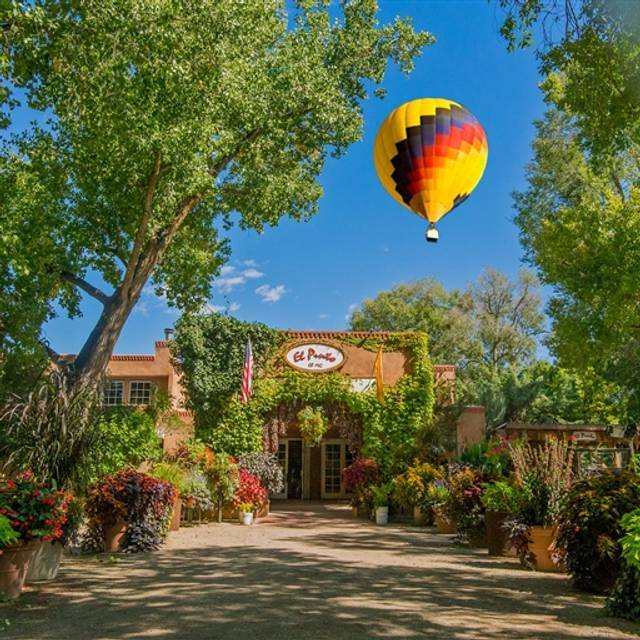 Our answer to recommending our friends are up in the air.... We liked being at El Pinto for the fact that we could be there and listen to our whole family talking and not interrupt anyone else around us. Our food was a bit cold and the chicken was dry. The amount of chile was less than what we've had before, I think the best part of our meal for the family was how hot the sopapillas were. They were good. Everytime I come to Albuquerque I try to stop off at El Pinto. The setting is so lovely and the menu has so many delicious options including many vegetarian and healthy options. i had the Calabacitas burrito with the green chili salsa and I can see why it is a fan favorite. It is plenty big enough to save half for another meal. We've been to El Pinto many times so I count this experience as just an off night. Food was up to standard but the service was not. After being seated at our table for 20 minutes (no water, chips & salsa, nothing) we had to get up and ask if someone was going to come and ask if we wanted to order anything. When someone finally did come we decided to order our meals along with the drinks as we had already been there for 30 minutes. Food took ages to arrive, the salad that was to come with my plate never came at all, another at our table had his loaded baked potato come when he was 2/3 through the rest of his meal. My water glass was not refilled, nor were the salsa bowls. I expect better than this from El Pinto, and as I said it may have just been an off night for whatever reason. I'll go again, but if I do and the service is not up to par it'll be the last time. I can remember going to El Pinto with my parents back in the mid 60's and loving it then. So to go back after near 50 years and find it is probably the best restaurant experience in Albuquerque was great. Always a great time! The green chili chicken enchiladas are the best!! Wanted to get some green chili to take home,but was all sold out- guess we'll be ordering online!Thans El Pinto, for a great experience! Our food took 45 min or more to make. My ribeye was over cooked. The steak came back when most people were finished eating at the table. The steak was sitting in a liquid like a soup. My enchiladas were just cheese and were supposed to be pork. Took my mom here for her birthday. The food has been good in the past but it was terrible this time. Cold and awful. They took it back to the kitchen to reheat and it came back even worse. Did not eat it and was given a small credit on our bill. Also didn't appreciate being seated in the enclosed patio area that has many uneven bricks on the floor. This was difficult and unsafe given the older age of my guests. I enjoy El Pinto and we go often. The atmosphere is festive. Salsa and chips are great. This was our first time having Sunday brunch. The menu sounds creative and appealing but the dishes we got were just okay. One plate of huevos rancheros served on a flour tortilla with undercooked eggs: The eggs were on top of the chile- looked like no cheese. The cheese was there, just in a glop under everything off to the side. Another dish eggs Benedict served on green chile biscuits with red chile and chile con queso and home fries. The poached eggs were way undercooked which ruined the dish. The order was for medium eggs. The home fries and biscuits were good and sauces tasty. Not sure we’ll go back for brunch. I would have sent the eggs back but no one checked on us in time. Did let management know and they said sometimes they have a problem with the kitchen and cooking eggs. Hope they fix the problem! Best Mexican food we had in Albuquerque. Very comfortable atmosphere. The food, ambiance and service was great! We will be back! The red Chile ribs were excellent, and Lilly, our server, made excellent drink recommendations. It was an altogether delightful experience. Overall, it was a very nice evening. The one problem was that the music was sometimes too loud, which made it difficult to talk. We appreciated having the music and some of the time it was not "too energetic." But sometimes it was too loud and made talking/hearing difficult. My suggestion is to either have the musicians be more in "background" rather than "performance" mode, or to let people know that the music could be pretty loud and ask them whether they want to be close to, or farther away from, the musicians.